The Iron Lady stars Academy Award winner Streep as Thatcher and Academy Award winner Jim Broadbent as her husband, Dennis Thatcher. Directed by Phylida Lloyd (Mama Mia!) the film is certainly dead set on gaining Oscar attention. This trailer screams Important with a capital I, particularly with the use of the score from Munich. Even if the film isn’t very good, expect Streep to be on the nomination ticket, and most likely winning. The Best Actress race is fairly lax this year, so Streep, whose been nominated a record sixteen times, is bound to get some serious attention the next few months. 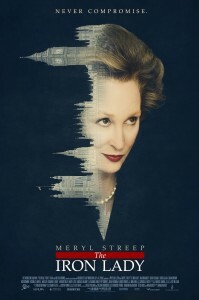 The iron Lady hits theaters December 30th, 2011. * Fun Facts: V For Vendetta was originally written by Alan Moore as a criticism of Thatcher’s unjust regime. Dolores Umbridge, the corrupt politicial character in the Harry Potter novels, is also inspired by Thatcher. Comments for Meryl Streep Courts Oscar In “The Iron Lady” are now closed.